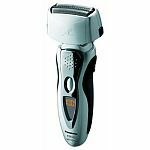 I would like to recommend the Panasonic ES8103 to your followers who prefer or require an electric shaver. I have sported a shaved head (by choice) for over ten years and have tried every shaving system imaginable. If you have a healthy scalp with no skin problems, nothing can touch the Gillette Fusion razors: quick, and slickly amazing. If, on the other hand, you have scalp issues like mine (seborrheic dermatitis) that are aggravated by wet/blade shaving, the Panasonic may be the answer. It provides a very slick, dry shave without a lot of pressure and can also be used wet. You have to go over the scalp several times, but gently... after which it looks and feels damned near as tight as the Fusion shave. If you need to shave dry or just touch up during the day, it's well worth whatever Best Buy is charging this week. Thanks for the report, Jon! I've been using a similar Panasonic shaver (the ES8077) for the last couple of years, and think it's an excellent device. I can't get mine to shave quite as close as Jon can, but I've been very happy with it.